We no longer carry this product. Choose the DDMX-512 instead. Automate lighting and interact with external devices using our DMX512 and digital I/O controller. Program scene/exposure lighting for advanced effects and automate bash lighting with ease. The default operation of the DDMX-S2 supports 99 channels, with specialized output on channels 101-199 and 201-299. If you already own the DDMX-S2 and would like to update it to use 512 channels with Dragonframe 4, please purchase the DDMX-S2 Upgrade Chip. Automate a work light (bash light) turning on and off. Automate keyframe-based lighting programs for your scene. Trigger a RED camera, film camera, or unsupported still camera. Trigger a motion control system for shoot-move-shoot integration. Trigger Dragonframe from an external system. DMX512 (or DMX) is a standard protocol for controlling lighting. When paired with one or more DMX dimmer/switch packs, you can control up to 99 different light channels. Interact with external devices using the built-in relay switch, digital input and digital output. 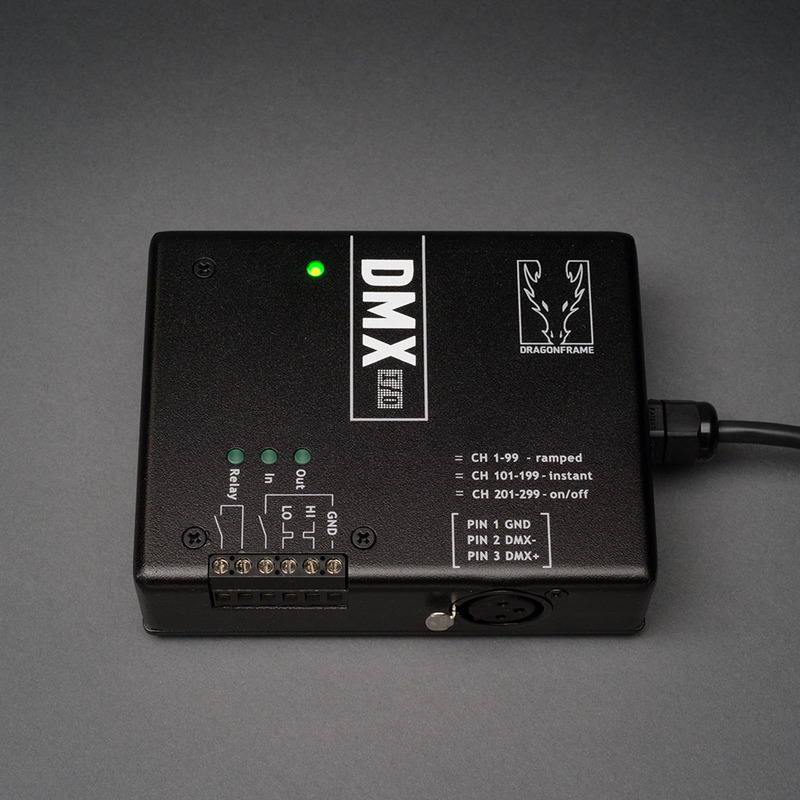 The DDMX-S2 interfaces Dragonframe to one or more DMX dimmer/switch packs. You will need to buy a DMX dimmer/switch pack in order to power your lights. You can find several DMX dimmer packs at Amazon.com . Make sure that the one you choose can handle the power requirements of your lights. You will also need a cable. You must use a cable designed for DMX, not a microphone cable. If you use a 5-pin DMX dimmer pack, you will need a 5-pin to 3-pin adapter. To prevent any possible damage to the host computer from badly grounded peripherals, all DDMX-S2 outputs and inputs are optically isolated from the host USB bus. The I/O channels “float” electrically relative to the USB, thereby minimizing the opportunity for ground loops. DDMX-S2 supports a USITT standard DMX512 output protocol. The DDMX-S2 output will easily drive a standard 120 ohm bus termination. The DMX channel provides packets of 199 slots, with a 50mS inter-packet period. The DMX port is typically equipped with a 3-pin XLR connector for easy connection to “entertainment” style DMX packs. To connect DDMX-S2 to a USITT standard 5-pin XLR connector for use with “professional” style equipment, use a standard 3-pin to 5-pin adapter. The relay is intended to switch low-power control signals like button presses, but it can also switch small amounts of power. Do not exceed 0.5A @ 24VDC, or 0.25A @ 125VAC. Logic out is a standard 5V, TTL level, logic signal (relative to the ground terminal). The signal is provided in both active high and active low versions. Maximum load is 30mA in each state. These signals may also be used as a differential pair with a termination load greater than 220 ohms. Switch in is designed to sense a switch closure to ground. This input will also take a 5V TTL level signal. Note that in keeping with a switch closure, the logic on this pin is active low. This pin is internally pulled to 5V with a 1Kohm resister. When driving this pin externally, do not exceed 5 volts. 4.7″ X 3.7″ X 1.3″ (12cm X 9cm X 3.5cm). Weight: approximately 12oz. (340g) with 5′ (1.5m) Type A USB pigtail. DDMX-S2 is built ruggedly, in a .090″ thick cast aluminum box and painted with a hard powder coat to survive years in a harsh stage environment. DDMX-S2 is a “high current” USB peripheral, drawing up to 220mA with all outputs active and fully loaded. As such it must be plugged directly into either a computer port or a powered USB hub. Your power source must provide at least 4.5 Volts. DDMX-S2 should not be plugged into a unpowered USB hub. USB peripherals send their power requirements to the system on initialization, and unpowered hubs are supposed to reject peripherals that do not identify as “low current,” that is, any peripherals that require more than 100mA.